Chakka kuru sambar, chakka kuru mezhukkuperatti or curry or stir fry or kootan are childhood favorite for me and my sister. It still is!! During our growing up years in Kerala, we had always cooked and ate the vegetables and fruits that were grown in our backyard. In fact every home had few mango trees, two or three jack fruit trees and of course a lot of coconut trees and banana trees. Apart from these, there used to be tubers such as yam, Koorkka or Chembu (Taro or Colocasia) and fruits like rose apple, custard apple, mangosteen etc. And the neighbors and friends always exchange these fresh fruits and vegetables. So my mom knows, which home has the best tasting mangoes or jack fruits or taro roots or rose apple. Those were the days which will never come back again. And now, it is fast living and fast foods. But i yearn for those slow paced, peaceful and tranquil life which is so unique in Kerala. Fast forward to today’s life and now coming to today’s post on Chakka Kuru Sambar. What can i say about it!! It is one such sambar which is a family favorite at my home. Or for that matter i should say it as a favorite in any Keralite home. This is a simple yet delicious sambar. Chakka kuru sambar is one of those special Palakkad Style Sambar apart from the Varutharacha sambar. It goes very well with rice, dosa or adai. Well, there are two kinds of sambar that we make – one which has the spices roasted and ground with the grated coconut. And the other variety which is just spiced only and only with the sambar powder. This Chakka kuru sambar is the latter part which is simple and easy to make. Though Chakka kuru sambar is very basic in nature, it gives so much of flavors and tastes, and not to mention the aroma of chakka kuru’s while cooking makes one to just literally love it. Soak the tamarind in water for 10 to 15 mins. Then extract juice from it and set aside. Crush the chakka kuru just a little, and remove the sharp outer covering from the seeds. Wash the chakka kuru and toor dal separately. Then pressure cook the chakka kuru and toor dal until done (or upto 4 to 5 whistles). Remove and set aside. In a kadai, place the tamarind extract, sambar powder, turmeric powder and allow it to a rolling boil. After about 15 to 20 minutes when the tamarind water is slightly reduced and the raw smell is gone, add the pressure cooked chakka kuru and the required salt. Allow it to simmer for few minutes. Then add in the cooked and mashed toor dal to the simmering kadai. Mix well and add a little water to adjust the consistency of the sambar. Allow to boil again and when done, switch off the stove and add a dash of chopped cilantro leaves. In a seasoning laddle, heat oil and temper with mustard seeds and curry leaves, and pour this seasoning over the sambar. 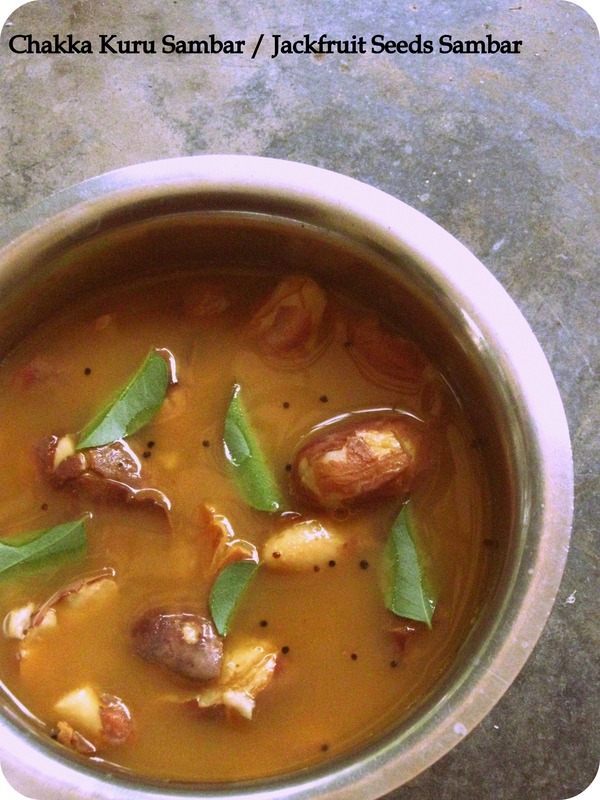 Serve the Chakka kuru sambar with rice and / or with tiffins like idli, Dosa or Adai. You can either just garnish the curry leaves or temper it and pour over the sambar. It is just upon each one’s personal likes and preferences. To enhance the flavor and taste, you can roast and grind the spices such as coriander seeds, red chillies, grated coconut, fenugreek seeds, asafoetida, curry leaves and little water (or coconut milk) for grinding. This will give a unique taste. Thank you 🙂 So sweet of you!! I too miss those years when mangoes and jackfruits were in abundance. Again a totally new recipe for me. Got to try it- but unfortunately with frozen chakka kurus. Reminds me of my grandmom’s kitchen! Kothiyavunnu!